“If you are an IT leader working to have demonstrable impact with your business partners, this book is a great handbook. It will provide you with the skills you need to succeed." “A lot of people talk about providing a road map to success as an IT leader but Marc really does provide that. Not only figuratively but literally. 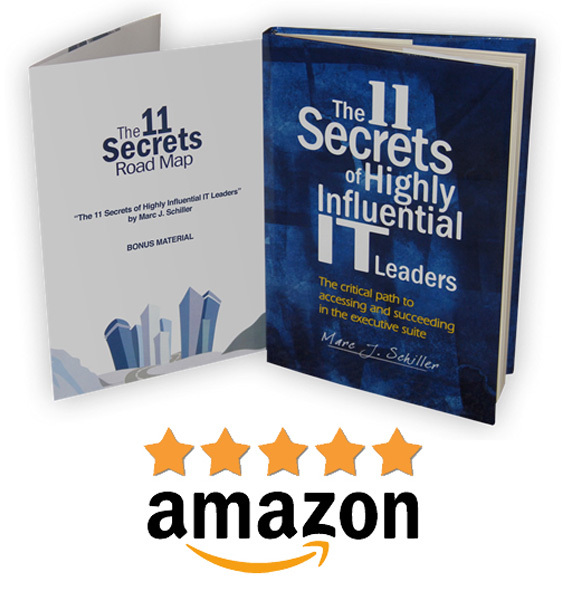 The 11 Secrets is filled with content that you think you may know but when you read it you will find a refreshingly challenging new approach to solving the critical challenges IT leaders face today. It didn’t just get me thinking, it got me to quickly take some important steps to raise my groups game one notch higher." “This book will take you on a journey that will not only validate and make sense of your experiences of the past, but will lay out a path for you to achieve your career goals of the future. Extremely relevant for aspiring IT managers and professionals. I plan to give a copy to all of my direct reports." “By far the best IT-related content I have read in a long, long time; presented in a simple, lucid and effective style." “Inspiring. I threw The 11 Secrets into my bag heading out on vacation not really expecting to get to it. I ended up reading it cover to cover even fighting off much-needed sleep on the plane to soak up every last page." “This book addresses one of the most important root causes of success or failure for IT professionals: the ability to influence peers, customers, stakeholders, and executives in IT-related matters. Whether you are a CIO today, hoping to be one tomorrow, or just want to do great work in our field, you will find this book to be a very valuable resource." “There are plenty of IT management books that talk in generalities. What makes The 11 Secrets stand out is the very tangible and practical method it presents. In particular, Marc delivers on the most important (and usually the most difficult) task for IT manager, i.e., how to build effective relationships with business stakeholders." “Building the right skills in senior IT managers is an important job for the CIO. This road map provides a clear set of steps for building those skills and achieving the influence IT leaders need to be effective with their stakeholders."